Ohio is highly industrialized, yet it also continues to draw economic riches from the earth. Among national leaders in the production of lime, clays, and salt, it is a historic center of ceramic and glass industries. Ohio’s soil supports rich farms, especially where it was improved ages ago by additions of glacier-ground limestone. Although most of the state’s income is derived from commerce and manufacturing, Ohio also has extensive farmland, and large amounts of corn, soybeans, hay, wheat, cattle, hogs, and dairy items are produced, although the number of family farms is rapidly dwindling. Railroads, canals, and highways crisscrossing the state have since the late 19th cent. provided the means for transporting large amounts of raw materials and manufactures. Lake Erie ports, chiefly Toledo and Cleveland, handle iron and copper ore, coal, oil, and finished materials (including steel and automobile parts). 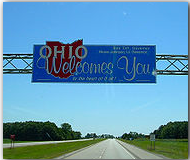 In spite of massive industrial decline since the 1960s, which has made Ohio the center of the Rust Belt, the state retains many manufacturing centers, with an emphasis on heavy industry. Leading products include transportation equipment, primary and fabricated metals, and machinery.